A famous man once said, “If you fail to plan, you are planning to fail.” That famous man was Benjamin Franklin and he was talking to the quarter of all B2B marketers putting out content without a marketing strategy. On top of that, another 38% say they have a plan, but it isn’t documented. While it’s true that the first step to a successful SaaS content marketing strategy is to start somewhere, there are right and wrong ways to do it. Find out how to create a SaaS content marketing plan that helps you create the content your audience truly desires. Here are the SaaS content marketing strategy wins to cling to and the mistakes to avoid. SaaS content marketing needs to find the balance between product and service. 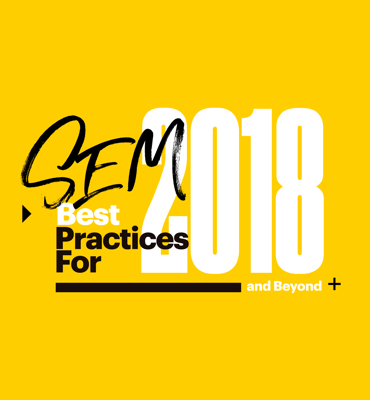 While it’s easy to get caught up in the features that make your software a desirable product, the most successful content marketing strategies have an additional element. SaaS companies that are well known for their content, including Moz and HubSpot, all create a community. Their content acts as a service for their target audience. 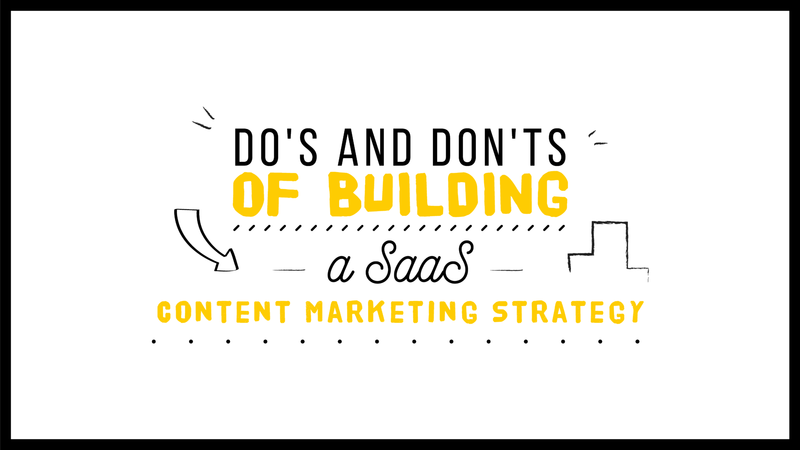 A SaaS content marketing strategy doesn’t have to be complex and advanced from the beginning. However, a plan does need to be in place. Establishing a framework and establishing organization keeps you from wasting time and resources. It’s also not enough to simply think about a content strategy but never write it down, as 38% of B2B marketers do. Therefore without writing the strategy down your work will be subject to inconsistencies between team members and it will be easier to stray from the objective of your plan. One of your top priorities for the content you deliver is to make sure it is relevant and helpful to the reader. Creating appropriate content is nearly impossible if you don’t understand who you are writing for and what they are struggling with. Therefore, creating a customer or buyer persona is one of the first stops you’ll make on your SaaS content marketing strategy journey. If you’re thinking about skipping this step, think again. 71% of B2B companies that exceeded revenue and lead goals were using documented personas. Letting your buyer persona be a guiding light in content creation moves you closer to establishing a community around your product. What has happened that inspired them to seek out your solution? What goals is the buyer trying to achieve with your solution, and what does a successful outcome mean to them? What would keep them from choosing your solution? What objections do you need to mitigate? What factors lead the buyer to choose your product? Is your buyer the decision maker, or do they need to pass information and suggestions upward? In the Capture stage, your buyer is still a stranger. Creating blog posts through keyword research, is the best way to capture their interest. Of course distributing that content on appropriate channels is a part of the capture stage. In the Convert stage, you should rely on form fills, compelling CTAs and landing pages to convert your new-found visitors. What type of content do you have to offer that will entice them to provide you with their contact information? The Nurture stage is where you take these new leads and well, nurture them. Most visitors won’t convert on their first, second or even third visit. Nurturing those leads with retargeting, personalized email content, etc is the best way to get to the final stage of the buyer’s stage. In the Close stage, your nurtured leads are ready to become customers. You’ve provided them with the TLC (Tender, Love and Content) they need to trust your brand over competitors. You’ve got the customer, now what? 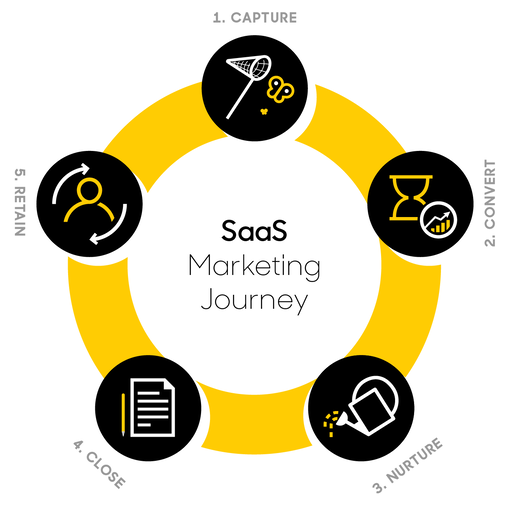 The SaaS marketing journey doesn’t end there. 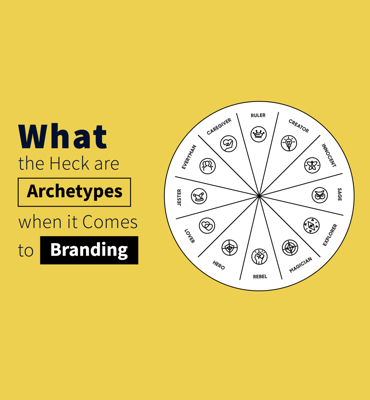 They best customers are loyal ones who become brand advocates and ambassadors. Surveys, relevant content and plenty of social listening will help you gage how your customer’s feel about your brand. For each of the stages of the buyer’s journey, there are buyer thoughts, actions, feelings, goals, and concerns to consider. A buyer’s step in the journey along with the internal factors, such as feelings and concerns, that motivate them will influence the type and topics of content you create to serve. A key benefit of SaaS content marketing is that it organically brings “free’ traffic to your site. Addressing SEO and putting keyword research into your strategy ensures your content works as an effective inbound marketing solution. When conducting keyword research for your SaaS content, it’s important to set realistic expectations. Creating content that is search engine optimized and among the top results for specific keywords won’t happen overnight. Expectations of how a piece will rank and how much traffic it will bring in should also be matched to the competitiveness and average monthly search volume for a keyword. After getting your content marketing off the ground, the next challenge will be maintaining it. Consequently, one of the challenges you’ll face each month when approaching content marketing is the constant need for new ideas. Therefore, a process for creating ideas and topics is a valuable addition to your content marketing strategy. Keyword research and feedback from your sales and support teams are perfect sources for content topics. By looking to these sources, you’ll ensure topics are relevant to your audience. Ideas for content should also be created for each step in the buyer’s journey and address the challenges they face along the way. At the end of the day, content should always address your target audience’s pain points, interests, and goals. No content marketing strategy is perfect on the first try. A certain level of testing and optimizations should always happen. However, these are the top 5 mistakes to avoid when establishing your strategy. If “blog posts” are the first type of content that comes to mind when you consider content marketing, you aren’t alone. Blog posts are a valuable and popular part of any SaaS content marketing strategy, but they are only one piece of the puzzle. So what other kinds of content are there? We’ve covered the types of SaaS content your target audience wants to see here. After strategy and content creation comes promotion. Failing to include a promotion strategy in your content plan will render your hard work useless. Most of all, consider the channels where your audience lives, and test out posting times and frequencies to make the most of your efforts. Including a process to reach out to influencers and cross-promote should also be added to your strategy. If you believe that you need to post every single day for your content marketing to be successful; forget what you know. Therefore, don’t put up a blog post every day for the sake of quantity. It’s always better to have fewer high-quality posts than many irrelevant ones. A SaaS content marketing strategy is incomplete without specific goals. Without a clear understanding of what you would like your content to achieve, you’ll never know if your efforts were “successful” or not. A simple way to make sure your goals are clear is to make them SMART. Hence, they should be specific, measurable, attainable, relevant, and time-bound. By its very nature, inbound marketing is more “slow and steady wins the race” that other outbound methods. It’s important to remember that a conversion won’t happen right away, especially for content created for buyers at the very beginning of their journey. One way to make sure that your content marketing efforts aren’t for naught is to set up a plan to capture leads so that you can get user’s moving through your sales funnel and receiving value. Also, content can be linked to progress readers along the buyer’s journey. They deserve their own documented section that is easy to reference. 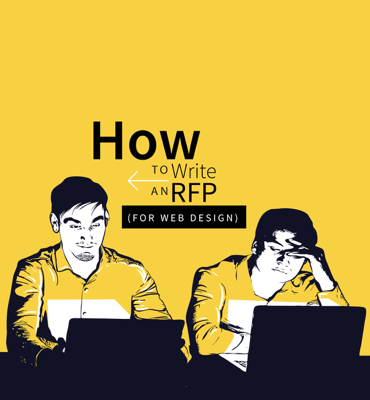 Creating and sharing these documents shouldn’t only fall on the marketing department, either. 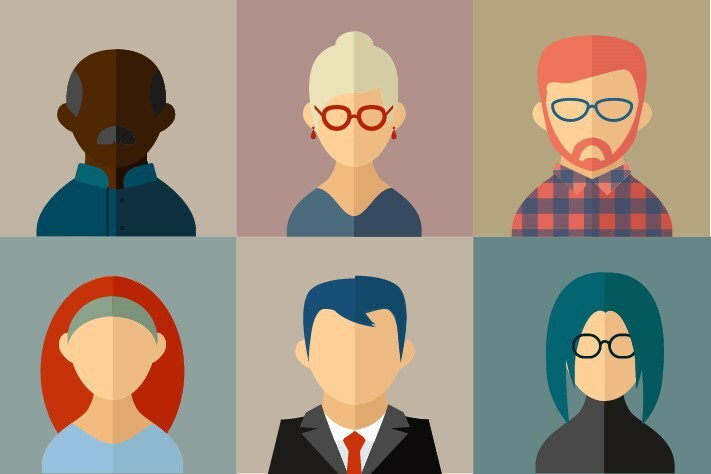 Include insights from the sales team in personas. The entire organization should understand the journey so that all functions work towards a common goal. Plan content in advance and put it on a calendar so that due dates don’t sneak up. This can be as simple as a shared spreadsheet, and tasks can be assigned to team members using whichever calendar system you already have in place. How and when will content be shared? Document the process. By doing this, you’re ensuring that team members understand what needs to be done. Also, you can see at the end if there’s room for improvement. Promotional tasks should also have a place on the editorial calendar. Keep goals and metrics in a central location, and measure actual performance against goals. The second step to this would be to set time aside to review if benchmarks have been met and what needs to change to hit or maintain goals. Finally, make sure to bring all of your ideas and plans together in a document.